ALUMNI couple celebrated their 21st anniversary this year recalling a “chaotic” yet happy wedding in 1993. New Brighton born “people’s person” and businesswoman Nomahlubi nee Buyambo and her architect husband Tim Hewitt-Coleman were married a year before the birth of the new democratic South Africa and had a larger than expected number of wedding guests as. This because the community had never witnessed a white man marry a black woman before and gate-crashed their wedding. The couple met in 1989 through Hlubi’s brother who then shared a room with Tim while he was a student at the former UPE. The happily married couple have three children. Well done to Nicholas Kwarikunda, a Physics PhD student and part of the Centre for Energy Research’s PV Group, for winning the poster prize in the Concentrator Photovoltaics (CPV) section at the 29th European Photovoltaic Solar Energy Conference (EU PVSEC) held in Amsterdam last week. The EU PVSEC is the largest international Conference for Photovoltaic Research and Technologies, Industries and Applications. 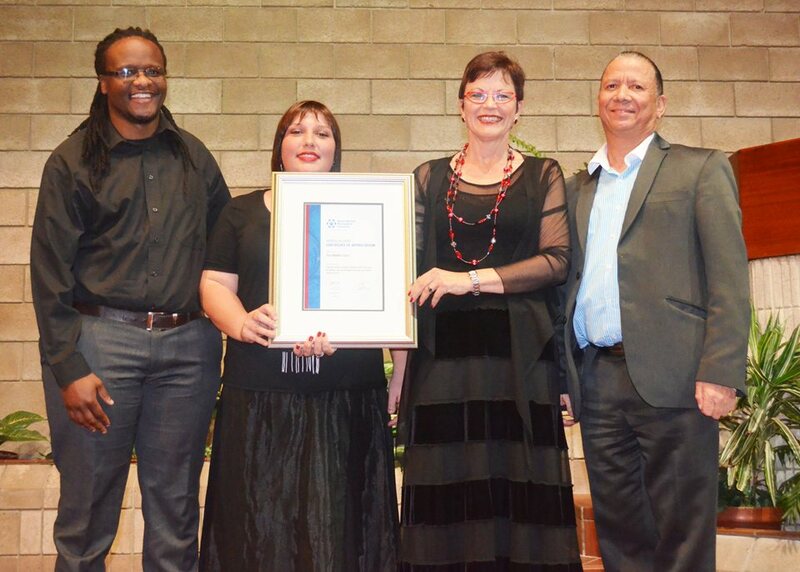 The NMMU Alumni Association presented the NMMU Choir with a Certificate of Appreciation at their 20th Anniversary Concert held recently. The Choir was recognised by the Alumni Association for their 20 years of great ambassadorship and for building cultural bridges through excellent choral music. Receiving the award on behalf of current and former choir members were Mzukisi Kota, Jessica Horne, Junita van Dijk (conductor) and President of the Alumni Association Randall Jonas.